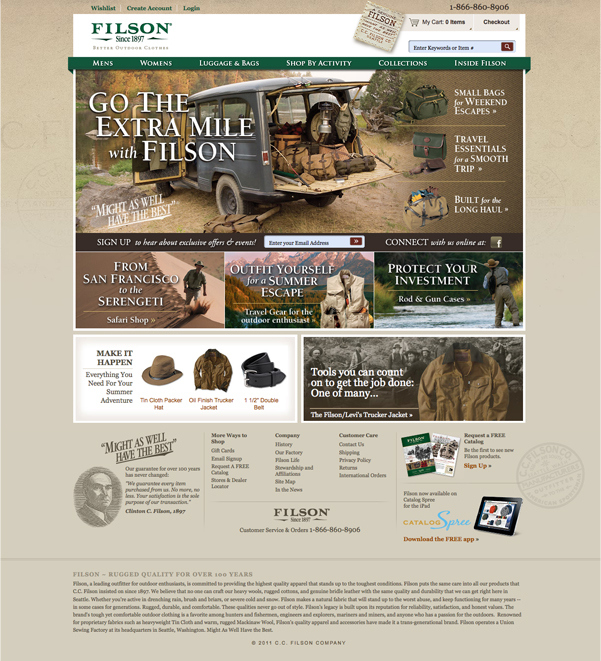 Created an award-winning homepage design for Filson and overhauled its eCommerce site as a team on all levels which resulted in Filson earning the “2011 Multi-Channel Merchant of the Year Award” in all categories and the ”Gold Award in Apparel Under $20 Million” category. 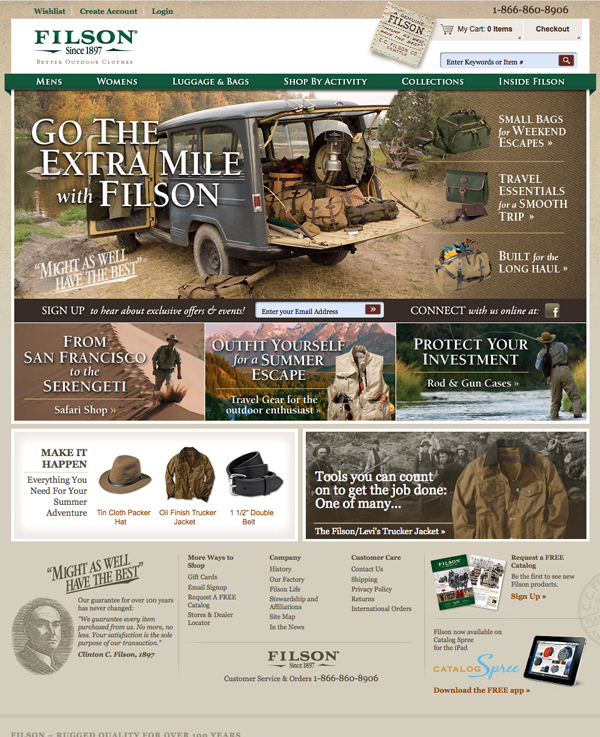 In my role at the eCommerce consultancy Zane Ray, I was one of 2 primary designers who helped redesign the Filson.com eCommerce site. It was a large-scale redesign for this American heritage brand and 100+ year old outdoor clothing outfitter based in Seattle. We pitched the client 2 very different design directions. Filson chose my design for the homepage, which set the tone for the site's look and feel, the site template, and the rest of the site's inner pages. UI and site architecture were co-created in concert with the dev team to allow for an innovative user ratings and reviews system across the product pages, as well as additive navigation and search filters across all products and categories. This made for a robust and flexible user experience. 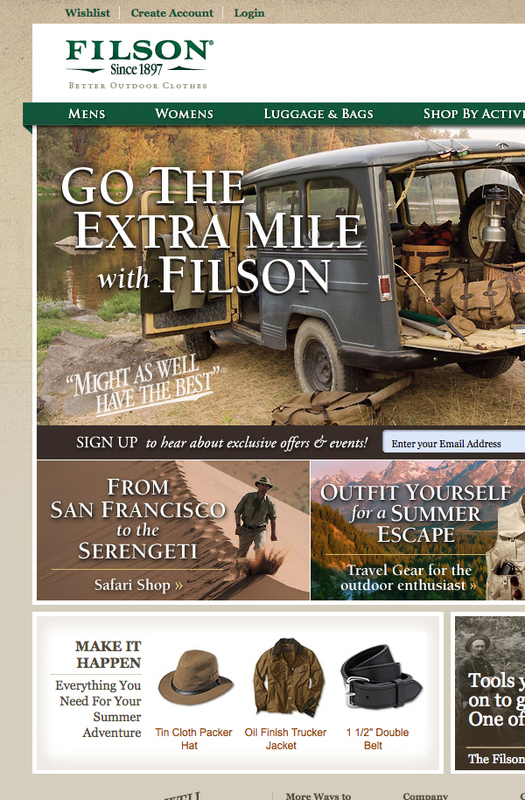 We designed the site using archival imagery to honor Filson’s rich history as an American Heritage Brand. A sizeable amount of photo research was required along with the integration of extensive market research on Filson's brand following. This made for a unique challenge, in that the brand had to appeal to 4 different types of Filson devotees.